Border incident: as the midnight sky blazes with New Year fireworks, a young man sprints full-pelt across the wide expanses of a colossal, concrete river-bed, small rucksack jiggling his slender shoulders. Behind him, Mexico, land of his birth; ahead of him, California, the state where he grew up and to which he ardently longs to return. He's Nero Maldonado (Johnny Ortiz), whose negotiation of frontiers both geo-political and personal is the focus of Iranian writer-director Rafi Pitts' fifth fiction feature "Soy Nero." On paper, this was perhaps the most promising of the eighteen contenders for the 2016 Golden Bear: Pitts debuted in Berlinale competition a decade ago with his international breakthrough "It's Winter" (2006) and tried again in 2010 with "The Hunter" (2010). Both went home empty-handed, but Pitts' reputation was steadily growing. "The Hunter"—spare study of a man partly defined by and partly at odds with his geographical/political contexts—starred Pitts himself as an ordinary individual pitched into a cycle of violence by the killing of his wife. It obtained art-house distribution in numerous major territories including the USA, Australia and most of Europe. Two years later, Pitts scored a small but crucial role as a consular official in Ben Affleck's Best Picture winner "Argo"—controversies over which have effectively prevented him from returning to his homeland. The half-English, London-educated Pitts—a familiar face around the festival circuit—has now become not so much stateless as a truly international, frontier-transcending figure. Likewise, his films: German-French-Mexican-American "Soy Nero" (Spanish for "I am Nero") was shot by Greek cinematographer Christos Karamanis ("Chevalier"); edited by France's Danielle Anezin; co-written by Pitts and Romania's Razvan Radulescu. The latter was also responsible for Cristi Puiu's epoch-shaping "The Death of Lazarescu", Cristian Mungiu's Palme d'Or laureate "4 Month 3 Weeks and 2 Days", and "Child's Pose" by Călin Peter Netzer—the 2013 Golden Bear winner. Added to this impressively auspicious pedigree, the picture's subject-matter—the "Green Card soldier" phenomenon, by which aspiring Americans can fast-track their US citizenship via military service—strikes topical chords in an year when right-wing presidential candidates have adopted predictably belligerent stances on complex immigration issues. The Republicans' attention-seeker-in-chief Donald Trump set the hawkish tone back in June 2015, in the very speech that announced his candidacy: "I would build a great wall," he thundered, "and nobody builds walls better than me, believe me, and I'll build them very inexpensively. I will build a great, great wall on our southern border. And I will have Mexico pay for that wall." Ambition is one thing, of course; achievement quite another. And while "Soy Nero" may yet pick up some kind of prize here—from a jury headed by the politically-engaged American actress Meryl Streep—Pitts' breathtaking frontier pyrotechnics turn out to be a false dawn in more ways than one. Early, largely wordless sequences set around the Tijuana border—whose fences extend out into the Pacific Ocean, and form ad-hoc volleyball nets for international "teams"—make an impact. 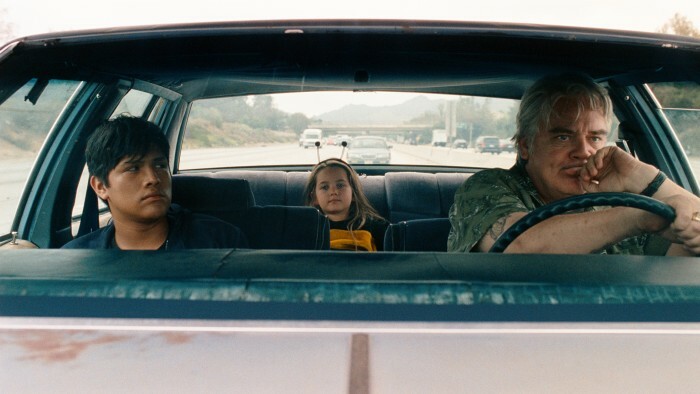 But screenplay issues kick in almost as soon as Nero has made it to California, quickly obtaining a ride from a genial-seeming veteran, Seymour (Michael Harney). "I'm a DREAM kid," he enthuses, detailing his plan to obtain the magical Green Card via the "DREAM Act" which he says came into force in the aftermath of 9/11. Seymour, a nicely ambiguous figure who comes across like a chummy uncle one minute and a potentially murderous reactionary the next, is scathing about Nero's goals. Showing him a plain filled with wind turbines—which, he reckons, consume more energy than they create—Seymour explains that the green-card soldier program is, like much else in the United States, a "set-up" built on cruel deception. Nero does seem to have been somewhat misinformed about the DREAM Act (Development, Relief, and Education for Alien Minors)—which has so far failed to pass into legislation despite seven separate senatorial attempts. Not that you'd grasp this from the film, which is very fuzzy about how the business of Green Card soldiers actually operates. Pitts and Razulescu reportedly drew particular inspiration from the case of former USMC combatant Daniel Torres—credited as an advisor on the film—who was deported despite having served a tour of duty in Iraq. Theirs is a fictionalized take on the experience of people like Torres—end titles inform that the film is "dedicated to all the Green Card soldiers who were deported after having served" in the US military—and it's one that rings slightly but naggingly false at nearly every turn. The picture's pacing unhelpfully slackens off once Nero meets up with his half-brother Jesus (Ian Casselberry), whose name he idiosyncratically pronounces "Jee-zus" rather than the usual Latino "Hay-soos", and who seems to have struck it very rich indeed in this golden land of opportunity. As Nero hangs out in Jesus' palatial Beverly Hills mansion, the lap of luxury he's enjoying is obviously far too good to be true, far too good to last. The explanation, when it finally arrives, involves a louche rock-star who's only glimpsed for a few seconds in deep shadow—but who looks very much like Jack White (thanked in the credits)—and makes little retrospective sense. Soon after, Nero somehow uses Jesus' fake ID to get into the military—details of this are blithely skipped over via ellipsis—and the rest of the running-time takes place in an unspecified middle-eastern location where Nero/Jesus mans a checkpoint with a pair of African-American comrades. The film again grinds to a halt as these two soldiers, who are referred to only via their home-towns of "Compton" (Darrell Britt-Gibson) and "Bronx" (Aml Ameen), heatedly discuss pop-culture matters—there's a definite improv air here, and one suspects that the screenplay here merely says something like "[they argue over rap.]" "Bronx" later reacts with unlikely incredulity and insult when he meets a fellow platoon-member whose name happens to be Mohammed ("he's a f**kin' A-rab! "); Compton gets his time in the spotlight when he's impressed by the music coming out of a family's car and launches into an impromptu dance routine. Several painful minutes seem to elapse before the performance is mercifully ended by Compton's commanding officer McCloud. The latter is played by Pitt's fellow "Argo" alumnus Rory Cochrane, who gets all of 20 minutes on screen and roughly half a line of dialogue, but inexplicably nabs second billing—in both the opening and closing credits—ahead of individuals like Harney and Casselberry who perform much heavier lifting. Could Pitts be making some oblique, meta-textual point about the lack of meritocracy in the United States in general and in the film industry in particular? Perhaps, but it's more likely that McCloud was the victim of some very late-in-the-day rewrites. Even so, too much of "Soy Nero" the first produced screenplay from both Pitts or Razulescu to be mainly written in English still feels like a first-draft effort, and there's little in Pitts' directorial box of tricks to distract us from the script's nagging deficiencies. 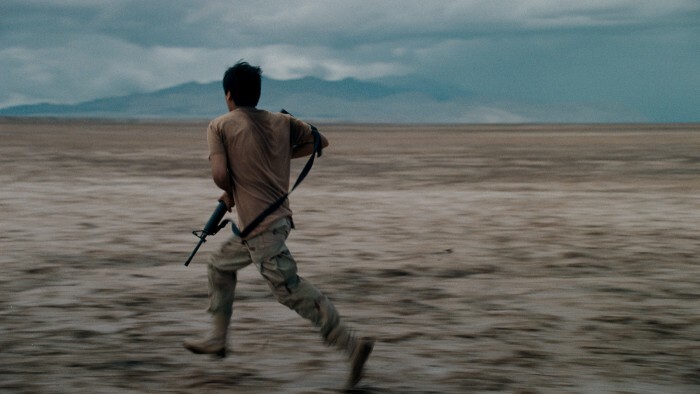 The "slow cinema" tropes he deployed in his Iranian outings are once again trotted out, to enervating effect in a final act notable for its lack of suspense and tension—even during a bomb-disposal sequence whose protracted nature leaves us in zero doubt about the explosive outcome. The victim, Armstrong (Kyle Davis), is on screen too briefly to really register as a character—so his death can't help but leave us unmoved. It's a different matter with Nero himself, of course, as the eponymous post-teen is present in pretty much every scene. But despite the efforts of the likeable Ortiz, this lad just never feels like an organic, three-dimensional creation. He makes most impact in the first few minutes when he's interrogated by hostile border officials, and his features exude a sullenly guarded restraint—the subtlety of Ortiz's work undercut by the fact that Nero ("black" in Italian) sports a black-and-white t-shirt bearing the large logo "Enemy." The central idea of military service as a route to citizenship was, meanwhile, dealt with more illuminatingly and imaginatively twenty years ago in Paul Verhoeven's scaldingly satirical "Starship Troopers." But whereas slow, worthily downbeat treatments of serious issues such as "Soy Nero" will generally be extended the benefit of the doubt—and berths in prestigious festival competitions—when it comes to interplanetary science-fiction extravaganzas, the attitude in too many snobby quarters is still a case of "Argo-f**k-yourself."